This newly formed position by Council is still in the developmental stage, creating exciting challenges for the Director. The position was filled for the first time, by myself, in October 2013, after much introspection having never been an ASSA Director before. It has been an exciting time with the setting up of the new communication channels (ASSA Discussion Group / Info Group), web site and Facebook presence which were finally all in place towards the end of 2013. It is here that I would like to give my heartfelt thanks to Auke Slotegraaf (ASSA Deep-Sky Director, Sky Guide Editor) for his invaluable support, comments, criticism, and his availability at all times when my ship seemed to be sinking on the high seas, as well as Christian Hettlage the ASSA web master. Observable and other astronomical related events are posted via various channels and include sightings, images, comments and questions from the public, to which I respond or pass on to the relevant ASSA Sections, specialists and collaborators. For this I would like to thank, Dave Blane (Shallow Sky Director), Tim Cooper, Greg Roberts, Brian Fraser, Allen Versfeld (Astrophotography Director), Auke Slotegraaf and many other ASSA office bearers and members for their assistance. 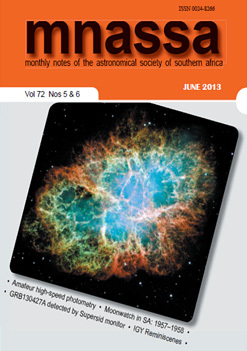 Thank you to Michael Poll (ASSA Pretoria Centre) for sending the Centre’s observing reports since February this year. These will be archived on the ASSA web page. I would like to encourage the Centres to submit their observing reports. The ASSA Facebook page as well as the new ASSA web site were up and running by early November 2013, on line for an eight month period to date. During this time numerous sightings, comments and questions have poured in and have been successfully addressed. These can be found on the ASSA web site, and of late have also been included on the Facebook page. It is encouraging to see how many of the public are noticing these night-sky phenomena and reporting their sightings to the ASSA website/Facebook. Two of the ASSA communication channels (Yahoo groups) on the web site, namely the ASSA Discussion group and ASSA Info Group have the following statistics since inception. The ASSA Discussion group is a means for members to interact, pose questions and have general discussions. To date it has 50 members. In the last week of June, eight messages were posted with a total of 219 posts to date, at an average of 27 posts per month. The ASSA Info group is a means to distribute news from Council, Centres, Section Directors and their Specialists. To date it has 76 members. A total of 26 posts to date, at an average of 3 posts per month. Translating to a total of 46% women and 54% men. There are 38 visitors from 27 other countries across the globe, as diverse as Argentina to Lithuania. Johannesburg, Gauteng, South Africa 53; Cape Town, Western Cape, South Africa 51; Pretoria, Gauteng, South Africa 26; Bloemfontein, Free State, South Africa 12; Somerset West, Western Cape, South Africa 12; Durban, KwaZulu-Natal, South Africa 9; Centurion, Gauteng, South Africa 9; Louis Trichardt, Limpopo, South Africa 8; Stellenbosch, Western Cape, South Africa 7; Roodepoort, Gauteng, South Africa 5; Port Elizabeth, Eastern Cape, South Africa 5; Randburg, Gauteng, South Africa 5; Pietermaritzburg, KwaZulu-Natal, South Africa 4; São Paulo, Brazil 3; Wellington, Western Cape, South Africa 3; Windhoek, Namibia 3; Tunis, Qabis, Tunisia 3; Welkom, Free State, South Africa 3; Vanderbijlpark, Gauteng, South Africa 3; Bogotá, Cundinamarca, Colombia 3; George, Western Cape, South Africa 3; Carnarvon, Northern Cape, South Africa 3; Bellville, Western Cape, South Africa 3; Lima, Peru 3; Vereeniging, Gauteng, South Africa 3; Itsoseng, North-West, South Africa 2; Krugersdorp, Gauteng, South Africa 2; Brussels, Région De Bruxelles-Capitale, Belgium 2; Kempton Park, Gauteng, South Africa 2; Rome, Lazio, Italy 2; Potchefstroom, North-West, South Africa 2; Lucknow, Uttar Pradesh, India 2; Boksburg, Gauteng, South Africa 2; Caracas, Distrito Federal, Venezuela 2; Brackenfell, Western Cape, South Africa 2; Natal, Rio Grande do Norte, Brazil 2; Brakpan, Gauteng, South Africa 2; Perth, WA, Australia 2; London, England, United Kingdom 2; Kampala, Uganda 2; Heidelberg, Gauteng, South Africa 2; Auckland, New Zealand 2; Kathmandu, Nepal 2; Polokwane, Limpopo, South Africa 2; Francistown, North-East, Botswana 2. The most engaged insights are from Cape Town in the 25 to 34 year age group. 18/11/2013 Comet Ison flyby of Spica, reached 848 visitors. 01/01/2014 Best stargazing events of the year, reached 1 300 visitors. 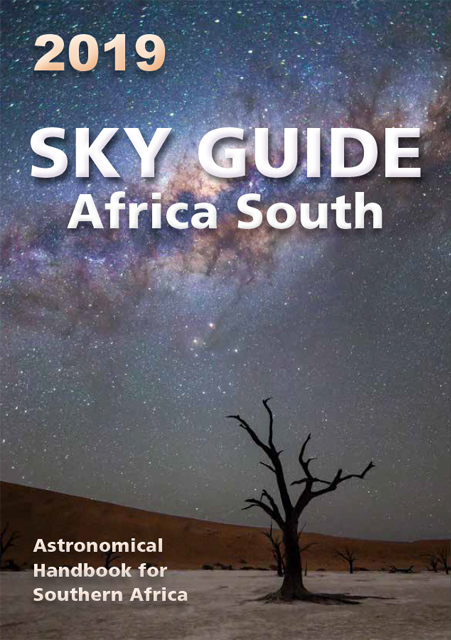 09/01/2014 Review of the 2014 Sky Guide, reached 365 visitors. 13/01/2014 Observers in Cape Town can enjoy the first bright occultation….., reached 282. 18/03/2014 The Moon occults Saturn……, reached 312. 16/04/2014 Upcoming observing evening and starparties……., reached 512. 18/05/2014 Meteor shower alert……., reached 547. 05/06/2014 Saturn is occulted by the Moon….., reached 1 000. Some memorable observations so far during this term kicked off with Comet ISON and its demise, the erratic behaviour of Nova Cen 2013, the first and second occultation of Saturn by the Moon, two fireball reports, massive sunspot activity at the beginning of the year and Comet PanSTARRS (C/2012 K1) now putting on a show. In conclusion, a productive first term putting to good use the communications technology now available, enabling ASSA to reach an even bigger audience, Southern African astronomy should go from strength to strength. And in the pipeline is an exciting deep-sky, imaging and observing development, a collaboration between Auke Slotegraaf, Carol Botha, Allen Versveld and the Observing Director, soon to be revealed. Upon the recommendation from the Deep-Sky Section Director, I would like to propose a Merit Award to Percy Jacobs for his initiative in promoting the ASSA Top-100 observing list and co-ordinating the top-100 observing programme at the Pretoria Centre.